Now don't just type your code. Expand it! 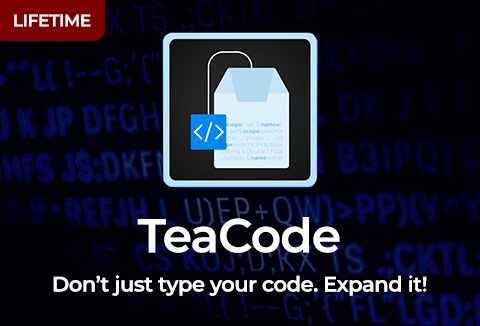 Meet TeaCode - The Code Expander for Mac that brings you to the future of coding. TeaCode allows you to write any code much faster with code expanders (dynamic snippets). It works with most IDEs, code editors & any programming language. Isn't it great? So start creating your own expanders today. Buy TeaCode now! A Look At The Preview Of TeaCode Code Expander! Why Choose TeaCode Code Expander? TeaCode is an app that replaces short patterns into the real code. The code is "generated" using a simple language that consists of variables, filters, optional patterns, and subexpressions (you can use one expression in another one). No matter what programming language you use, there is always lots of code to write. TeaCode writes it with you and it makes it all much quicker. Just write a pattern, press TeaCode shortcut and TeaCode will finish it for you. Super fast! TeaCode comes with over 80 ready-to-use expanders (built-in) for Swift, PHP, Objective-C, and HTML. And it also lets you define your own. It's extremely easy! Create them once, use them anytime. Write your code faster. Use multiple variables, filters, optional patterns, subexpressions to make them even better. Use your expanders almost anywhere. TeaCode works with most of the native macOS text editors (e.g. Xcode, TextMate, Coda, Espresso, etc.). You can export any bundle of expanders and share it with others. Importing is as easy as double-clicking on the bundle icon. TeaCode requires macOS 10.12 or newer. This deal supports license for one user and 2 computers. Now code like never before with the smartest code expander. At A Deal Price Starting From $9.99 Only!